Whenever I need to whip up a quick activity, color mixing is one of my top picks! Color mixing activities are always exciting and a perfect learning opportunity. 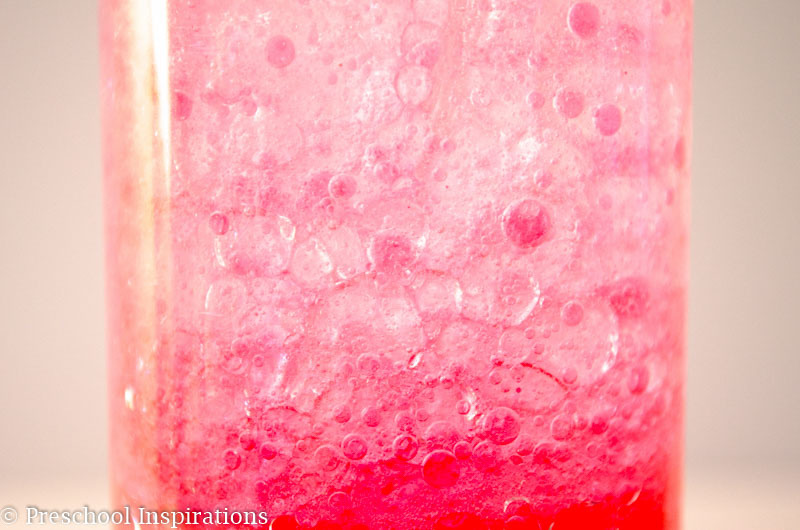 Today I have a color mixing sensory bottle with three easy ingredients! 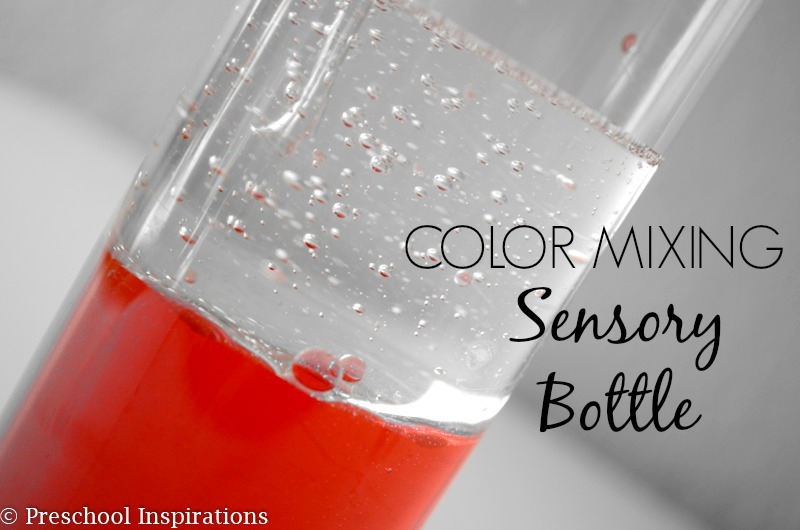 This color mixing sensory bottle is part of my Discovery Bottles Blog Hop, and this month the theme is Valentine’s Day. And while this is perfect for Valentine’s Day, you can use it any time of the year too! Be sure to check out the other fabulous discovery and sensory bottles at the end of this post after this one. Making a new color is a magical experience for a young child, and this color mixing sensory bottle also has tons of bubbles. After we made this discovery bottle, we all stared at it for a long time. I’ll be sure to post a video of it on my Instagram account this week so you can see how fun it is. The bottle has red water on the bottom and clear oil on the top half. When you shake it, then our new color shows itself! I love making pink! And the bubbles are absolutely amazing to watch as they pop! This could definitely be used as a calm down jar too. I found all of the materials at my local grocery store except for the liquid watercolor. The mineral oil is about $2, and some dollar stores carry it too. I have never seen liquid watercolor in stores, so that’s something that you would have to get online. As for the water bottle, VOSS water is at my local grocery store, but it’s not everywhere. You can easily substitute any type of bottle. My favorite bottles have sleek sides. This sensory bottle is half colored water and half mineral oil. The mineral oil is what keeps it clear but other oils could be substituted. They will just change the coloring. First, make sure to leave some room at the top for shaking. 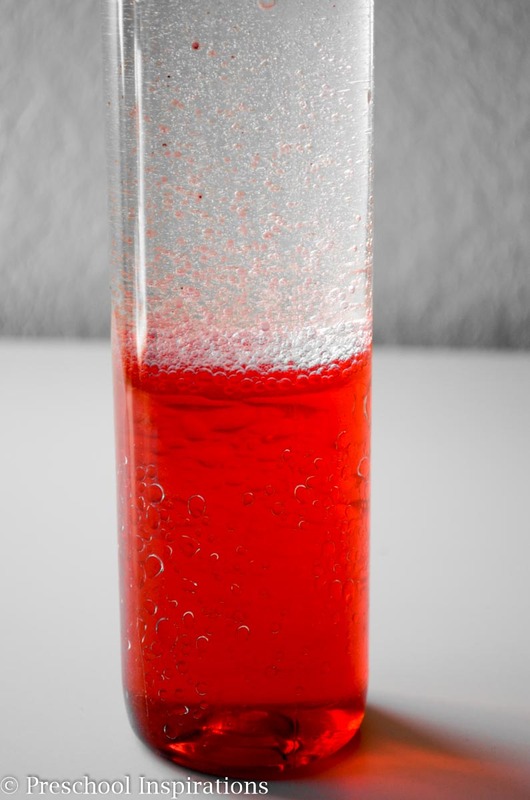 Then pour in the water with red food coloring or red liquid watercolor. Since every bottle is a different size, you just have to eyeball it to make sure you put approximately half in (after you consider room at the top for shaking). Next, add the mineral oil. Then shake and watch the beauty! After I made our color mixing discovery bottle, I asked my kids if they could make it change color. I told them that they couldn’t open it or add anything to it. They had to make it change color just the way it was. It only took them a few seconds before they realized that shaking it would turn it pink. And what a perfect experience to always help them remember that red and white become pink when mixed. What a great idea! I bet watching the colors is so mesmerizing! My preschoolers will love making pink! I can’t wait to try this! This is such a fun idea for a Valentine’s day discovery bottle. 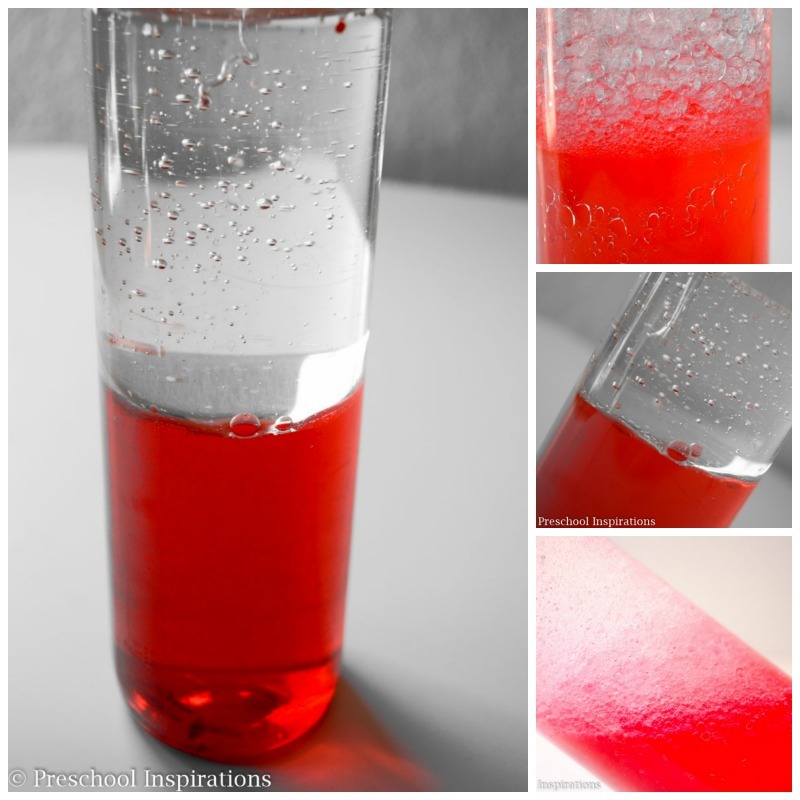 I love the idea of teaching color mixing through the use of these fun bottles… fun! This may be a silly question, but could you use other oils instead? Like a canola or olive oil? Hi Amilia! That’s a great question! I’ve heard of people using canola oil before, but I have not tried it myself. If you have some extra around, feel free to give a go :). I’d love to hear the results! Hi Diana! While these bottles look amazing, I am not sure I would try to have an entire school age class make them. That would overwhelm me! I hope you can find something that all of the students can do together! That is a tall order for sure. Hi there – I’m so excited, I have some middle school girls who are excited about making these with me. Did I miss where you put the measurement amounts for each ingredient? Could you help me out? Hi Grace! I updated the post to make it more clear. Let me know if you need any help :).